Please note that the content of this book primarily consists of articles available from Wikipedia or other free sources online. 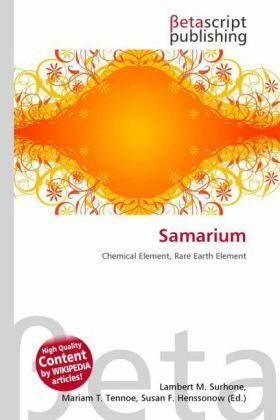 Samarium is a chemical element with the symbol Sm and atomic number 62.Samarium is a rare earth metal, with a bright silver luster. Three crystal modifications of the metal also exist, with transformations at 734 and 922 °C, making it polymorphic. Individual samarium atoms can be isolated by encaspulating them into fullerene molecules. Samarium oxidizes in air and ignites at 150 °C. Even with long-term storage under mineral oil, samarium is gradually oxidized, with a grayish-yellow powder of the oxide-hydroxide being formed. The metallic appearance of a sample can be preserved by sealing it under an inert gas such as argon.